A bathroom remodel is one of the most popular and beloved home renovation projects. Homeowners that are lucky to have large size master bathrooms also like to make big and small updates to the space. You can make minor but effective updates for under $25,000, do a full remodel for about $35,000, or create a jaw-dropping bathroom spa for $50,000+. 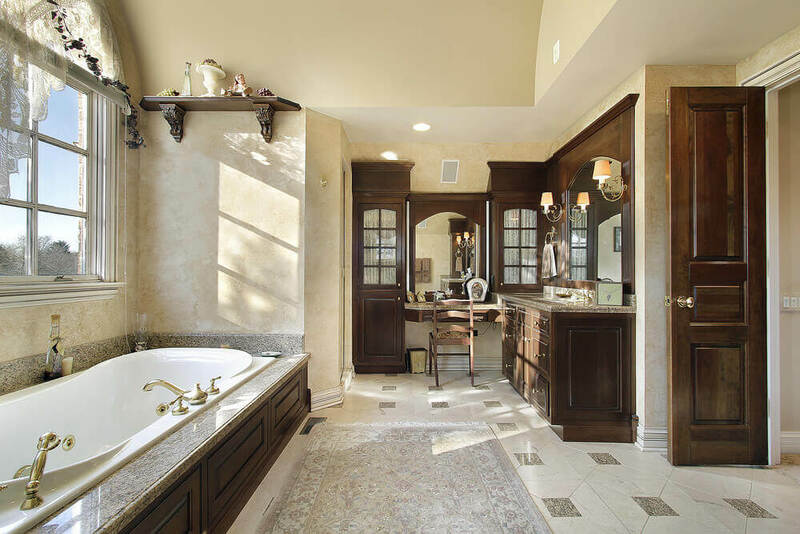 Remodeling a master bathroom can bring in many tangible benefits. The big ones are: boost the value of your home, make your house easier to sell, make better use of the space and get rid of clutter, increase your overall enjoyment of the bathroom. If you are on a tight budget is possible to remodel a master bathroom for under $20,000, but don’t expect any fancy frills in this price range. Alternatively, sky is the limit to luxury bathroom remodels. These typically average $60,000-75,000, but can easily go over $100,000, depending on the size of the space, scope of work, and quality of materials used. 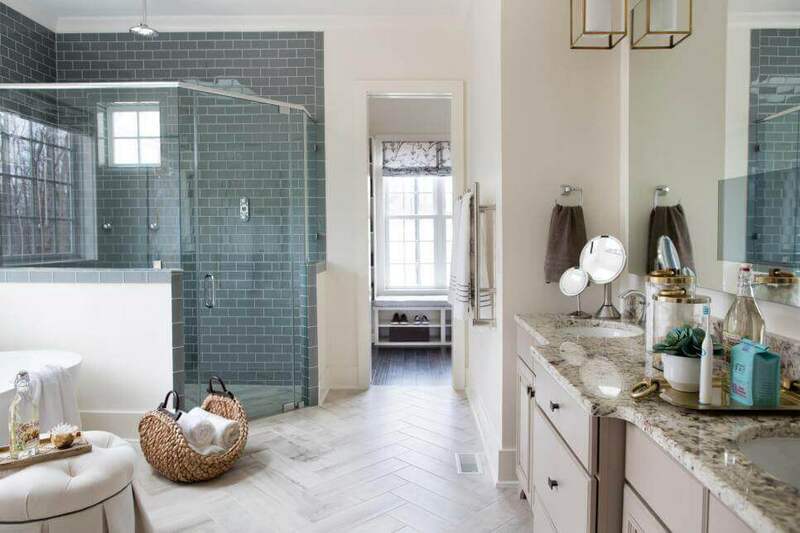 Usually, such an expensive remodel involves a lot of costly labor such as expanding the bathroom footprint, removal and building of walls, moving around plumbing fixtures, putting in lighting, installing radiant flooring, custom building shelving, shower enclosure, etc. Naturally, these awe-inspiring bathrooms will also make use of the most expensive building and finishing materials. However, the end result is well worth it to the homeowners, because they get to enjoy their dream bathroom. When doing a gut renovation, its advisable to hire a professional bathroom designer. He can help you make the best use of the new space. It would be wise to create an effective floor plan, that not only looks good, but is also functional. You can use our Bathroom Cost Estimator to get a more accurate price for your renovation project. Any type of renovation, including a bathroom can be broken down in to three general levels. The level that works for you will be determined by 1. your needs 2. your budget. Take a look at the chart below that details what type of jobs and remodels would be included in each of the levels. Typically Level 1 renovations are best suited for homeowners that want to sell their home and need to give their bathroom a face lift. If your master bathroom is starting to look a little old and dated, you can replace out all the fixtures, put fresh paint on ceiling and walls, accent tile on one of the walls or shower, and possibly replace flooring tile. These changes are for the most part cosmetic, and don’t require extremely expensive labor. You also don’t need to spend thousands of dollars on luxury fixtures, especially if your home is more modestly priced. Your goal is to create a fresh look that will impress prospective buyers. Comparatively, Level 2 renovations are more involved, and make use of much nicer materials. These are most appropriated for older homes, where a master bathroom requires more complex updates. These may involve replacing out the old tub with a steam shower, doing electric and some light plumbing work. Most homeowners go for this level of remodeling, whether they are selling their home or staying in it. Lastly, Level 3 remodels are for people with deep pockets, and budget is not much of a concern here. Usually, these are homeowners that want to stay in their house and want to create a luxury, spa-like bathroom that they can enjoy. As a result, the old bathroom is usually gutted and a designer creates a whole new room that answers to every desire of the residents. Before embarking on such a major remodel, its important to have an idea of where you will be spending the money. This chart is based on data across the US and breaks down where people end up spending money on their bathroom remodels. Keep in mind that these are just estimates. The costs for different items and services will ultimately depend on where you want to splurge vs. save. Some things are pure necessity where as others are pure luxury. Pro Tip: its recommended to set aside at least 10% of your total budget for unforeseen expenses, as these often come up. This is particularly true in older homes as well as gut renovations, where unexpected issues are uncovered once the work begins. Once you start researching different materials and products that you may want to use in your bathroom remodel, you will notice that the difference between the price of moderately prices vs expensive items is staggering! For example you can get a new acrylic tub for as low as $250-350 or a stone or wood soaking tub for $3,000-6,000+. Stock cabinets can be purchased for under $1,500, where as custom solid wood cabinets for a bathroom can easily cost $10,000-15,000. A toilet can cost as little as $99 from Home Depot or as much as $1,800+ for a fancy TOTO model. The same holds true for tile, sink, counter tops, shower head, faucet, lighting and anything else you may want to have in your bathroom. Sometimes the difference in price will be justified by a higher quality, longer lasting material, more beautiful design and finish, etc. At other times, you will not be able to tell the difference between two items that can be hundreds of dollars apart. If you are on a budget, the good news is that there are many inexpensive products that replicate the look of high-end designer items. For example, there is a wide range of porcelain floor tile replicas that look like wood, granite, marble, etc. Its no secret that out of all home remodeling projects, redoing the bathroom is most labor intensive. So much so that the cost of professional labor can end up taking up as much as 50-60% of the total budget. Not only is professional labor expensive, many homeowners are unpleasantly surprised when they discover that there are big price variations simply based on where they live. A homeowner starts out doing research on line and gets some price quotes for a bathroom remodel. However, once he calls up local contractors, she may get bids that are as much as 20-30% higher than what she read on line, on sites like Home Advisor. This is because pros charge difference rates based on where they are located. An average bathroom remodel in Minnesota may cost $12,000, whereas the same exact bathroom in San Francisco will cost $28,000. There can even be price differences between towns in one city, depending on the cost of real estate in them. So, an overall higher standard of living, higher home prices in a particular neighborhood can make a big difference in the bids that you get. So, don’t be fooled by cost estimates that you see online. Instead, contact a local remodeling pro and get realistic quotes for your bathroom remodel. One of the biggest challenges of doing a major bathroom renovation is seeing eye to eye with the contractor. Not only in the beginning, when you sign the contract, but also through the completion of the project. Misunderstandings and mismatched expectations from both sides can often turn a dream remodel in to the worst nightmare and endless money pit. However, all of this can be avoided, if you follow these simple tips. Doing this alone, with take care of 90% of all potential problems. An itemized contract will spell out in great detail, exactly what work will be completed, estimated time of completion, as well as materials to be used. There will be a price next to each of the items in the contract. There should also be a clause that accounts for any potential additions to work and increased costs that may come up along the way. Another issue will be that a contractor will simply fail to complete something and then say that it wasn’t part of the contract. He can either ask for more money to finish the job or leave it as is. This is another great source of contention. Often a contractor will say that he will provide a glass shower door, or floor tile and will give you the price. He may also describe the item to you. Pros can usually make money this way, because they give you a slight mark up on materials that they can get at a discount. The problem is that once he brings over the material, you may not like it!!! Arguments can start, but its usually too late, because it has already been purchased. If you are someone who doesn’t care about the exact color shade and size of a cabinet or tile, etc, leave it to the pro. However, don’t start a fight once the materials arrive. However, if you know that you are very particular, your best bet is to purchase the materials yourself. If you want to leave this job to the contractor, ask for catalogs or pictures, and choose a specific product together. Don’t forget to put it in the contract! Often, once the job is mid way complete, a homeowner may realize that they don’t like the way the bathroom is turning out. Sometimes, its minor details that can be fixed or added along the way. At other times, it can be major things that require a complete do over. This situation can be extremely frustrating for both the pro and the homeowner. To avoid it, make sure that you really think through every detail of your new bathroom (floor plan, functionality, design, color scheme, materials, etc). Once, you come up with the final plan, stick to it! Otherwise, you will keep changing your mind along the way, and will have to keep paying more money to finish your bathroom.